Pictures are for reference only, actual container colors may vary based on availability. For specific color/fragrance combination please call your order in or call for information. Filled with 8 oz. of American Soybean WaxTM. Measures 3"h x 3.5"w with a 45+ hour burn time. Refilling information: One container of Candle Refill Wax will refill this container three times. 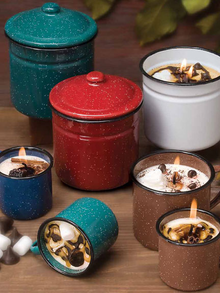 You will want to use one of the #62 wick, and, to create the same look as the original candle, use our new White Candle Refill Wax when refilling. 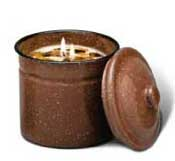 Refilling information: One container of Candle Refill Wax will refill this container one and a half times. You will want to use two of the #51 wicks, and, to create the same look as the original candle, use our new White Candle Refill Wax when refilling.